Sugar is No Worse For My Teeth Than Other Foods, Right? Wrong!!! All of our lives we've been told to cut back on sugar, watch our intake of sugary foods, brush right away and never eat sugary foods at night before bed. Turns out there's actually something to that advice that clearly many of us ignore, myself included. When it comes to your teeth, remember this: Sugar is sugar. Sucrose, fructose, lactose, etc. it is all sugar. Whether it comes in the form of a candy bar or fruit, one is just as bad as the other with respect to your teeth. Raisins, particularly, have a high level of sugar. Soda is the worst culprit of all. You see, sugar feeds bacteria. Sugars hide out in small nooks and crannies in your mouth and between your teeth and reek havoc on your tooth enamel over time. Bacteria in turn causes acid in your mouth that eats away at the enamel. Most of us don't brush right after eating something sweet. This allows time for all that bacteria to multiply and cause damage without our knowing it, until.... the dreaded cavity, or worse....a toothache strikes. Always brush after a sweet snack or soda. After drinking a soda, rinse your mouth with water first to wash away as much as you can, then brush. You'll be glad you made the effort in the long run! Dentistry IS a science. It is also artistry. But, does this justify the high cost? So often we will have someone call our office and they are absolutely shell shocked at the cost of a dental procedure or a treatment plan. Let me start by saying that dentistry is rarely simple anymore. It is a science, yes, but it is also a fine art, and in many cases you get what you pay for. Cosmetic dentistry, in particular, is among the most costly. If you've ever seen a full mouth reconstruction done, you'll have great respect for the dentist/artist. This is a craft that requires at least 8 years of schooling, constant continuing education and even further instruction and practice to be able to perfect these restorations and perform oral miracles. Not to mention the high cost of the technical machines and tools needed. If you understand that, you understand why the cost is so high. But, if you are one of those people who visits the dentist every 10 or 20 years, there is no avoiding the shell shock factor, which is why I've linked this blog to an informative page. I recently found a site that gives the average consumer an idea of what restorative dentistry costs. It is broken down by procedure and it's probably the most informative, simple breakdown I have seen to date. If you are considering cosmetic restoration or have many dental issues and are in need of a full-mouth makeover, look HERE first. I think you'll be glad you did. The moral of the story here is to visit the dentist regularly for cleanings (for prevention, if nothing else) and stay informed. Don't become a shell shock victim! While scrolling on social media last week, I saw a sponsored ad showing a new toothbrush called the Amabrush. My first initial reaction was "that's gross" and I kept on scrolling not paying any further attention to it. Yesterday I came across an article about the Amabrush (the same toothbrush I saw on the ad last week) so I decided I would see what its all about! 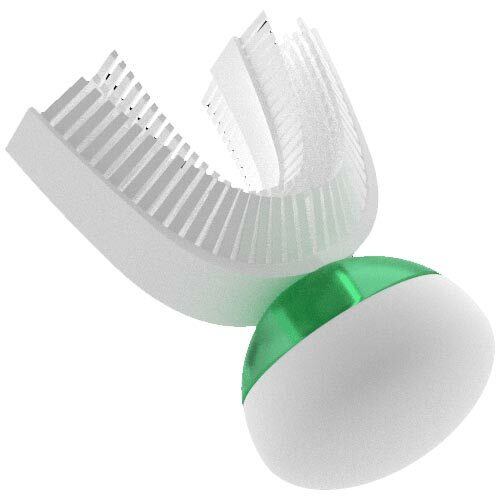 The Amabrush is a newly developed toothbrush that can clean your teeth in 10 seconds. CRAZY!! Its whole purpose is to save its users time by cleaning all tooth surfaces simultaneously. The device consists of a handpiece, single toothpaste capsule (comes in three varieties), a antibacterial silicone mouthpiece and charger. According to Kickstarter the whole set costs $91.31. Like a regular toothbrush the silicone mouthpiece needs to be replaced every three months, at a cost of $6.93 each. The toothpaste capsule lasts about one month, the replacement cost is $3.47 each. The first adult version of the Amabrush is expected to be released in December 2017 and the company plans on making a smaller version for kids age 6+. What are your thoughts on this new toothbrush? Would you try it? *Please note the Amabrush doesn't replace flossing or visiting your dentist for regular check ups! Dental centers are offering specials everyday. There are many sites out there that offer coupons and other promotions to get drive patients into the dental office. However, I would caution you to using that as your primary dental coverage. I say that, because there are people out there that do. Every time they go to the dentist, they are looking for that coupon or promotion that will save them the most amount money possible. Sounds reasonable right? Well, again I caution you about doing that and here's why. 1. A coupon or promotion is just that! It is not an open ended offer. It is a limited time special to drive you into that dentist office, who in turn is trying to retain you as a patient. The offer will end! Most of them are new patient special and you will only see that price on your first visit. So if you do return and you don't have coverage, you will be charged full price. 2. If you have exhausted the promotion at one dental office and you go to another one to use their special, you are starting over with as a new patient. Which means, new x-rays, new exam, new treatment plan, new diagnostics. Ideally, you should think of your dentist as another general practitioner, although most people don't. When you go to your regular doctor for treatment, you usually stick with that doctor through the course of your treatment. It should be the same way with your dentist. The longer you stay with the your dentist the better your dental health would be. Now back to the coverage. Regardless, YOU NEED DENTAL COVERAGE.. PERIOD.. The cost of dental care is high and is still increasing. You will wind up paying a lot of money out of pocket for your dental work. So, although the specials and promos are nice, they are not adequate enough to cover you for the optimal dental health that you should have. I was 14 years old when my dad (Clay Parker) and my uncle (Gordon Parker) announced their idea for a new crazy business venture. They were going to start a dental coverage plan. For my uncle, this was a new opportunity in a field that was he was already working in as he was currently a sales representative for dental plan that had some really shady business practices. For my dad and our immediate family, it was a big change in lifestyle. All my life, (to that point), was spent with my dad and mom both working in the flooring industry; which was the trade industry for the Parker family that went a few generations back. To know that my days of picking up carpet scraps, laying pad and vinyl and prepping floors with my dad was coming to end was unfathomable at my young age. However, the career change was welcomed and my dad and uncle took it head on. Little did I know that 25 years later, this crazy business venture, now known as Savon Dental Plan, would be an integral part of life and something that I am more passionate about than anything else. Growing up in the company, I have seen many people come and go. I have witnessed every up side and down side that we experienced. I got a front row to seat to the movement for "person to person" sales to more of the "digital and phone" sales. I have had the privilege of watching this company grow from the City of Phoenix, to the 23 States that we are in today. I have seen ideas succeed and and ideas fail. 1. We used to have a call center that was called the "Dog Pound"
2. We used to generate leads via computerized phone calls. 3. Most of the Parker family has worked at Savon at some point in time. 4. We used to have sales reps that signed people up at home. 5. Gordon Parker (our Late President) used to use the alias Tom Peters when signing someone up, so that they didn't know that it was the President of the company signing them up. 6. Gordon made everyone study a city map and gave us all tests before we were allowed to be an outside rep. (he didn't want us to get lost or be late because we couldn't find the place) **This was before GPS was available. 8. We used to have a scheduled "file audit" one a year, but usually it happened more when Clay couldn't find a file he needed. 9. Corilee Parker, our Director of Provider Relations, is the longest tenured employee at 25 years of service. (She was here from day 1 and is still here). So there are some things that you never knew about the "behind the senses" of SDP. There is so many that I could add, but this blog would be never ending. Throughout the month, I may post more as they come to mind. We have said goodbye to some key people who helped make Savon Dental Plan what it is today. Gordon Parker, Que Jeter and Dan Gopen, just to name a few, have all since passes away over the years. Some others that have passed also contributed in many ways and all are are surely missed. May they continue to rest in peace. We think about them everyday and will never forget what they have done for this company. Most importantly, this anniversary would never happen if it wasn't for our members. In a world to where the average customer stays with a company for 5-8 years and then moves on, we have a lot of members that have been with us for 10+, 15+, 20+ and yes, even ALL 25 YEARS! We appreciate everyone of you. Whether you were a member for 1 year, or have been a member for 25 years you are all important us and we thank you for your loyalty. Every once in while I get the privilege to talk to one of you and take the time to thank you for your membership. As we start the next 25 years, I can't help but ponder the potential that we have for growth. I also can't help but worry about what the future brings. Even after 25 years, the dental plan industry is still the considered by some to be the "bad step child" of the dental coverage industry. When in essence we are anything but that. Our plan WILL save people more money that insurance or any other plan out there and I will not stop shouting it from the mountain tops until everybody knows it. Although our company has gone through many changes over the years, the foundation to which we were built on has not changed. Our mission has not changed. Our goal has not changed. We will continue to provide great dental coverage at an affordable price. We will continue to be there for our members to help them out however we can. Lastly, you will never have press 1 for english and 2 for customer service when calling in. Thank you everyone for the last 25 years. I look forward to spending another 25 with all of you! For all the extras you'll find on a toothpaste label (foamers, binders, flavors) there are really only a few essential ingredients, says Daniel Mindiola, Ph.D., professor of chemistry at the University of Pennsylvania. Step 1.) Find a cavity fighter - Fluoride is the only ingredient approved to fight cavities. You'll see it listed as sodium fluoride or stannous fluoride, and it helps enamel patch itself up before decay can lead to a cavity. Step 2.) Ask yourself: Do I have sensitive teeth? If you do, you'll need a desensitizer too. Arginine bicarbonate plugs the exposed pores in your teeth for immediate relief. Step 3.) Now ask: Am I happy with the color? If not, add a brighter to your fluoride. Common ingredients include stain removers such as sodium tripolyphosphate or hexametaphosphate and hydrate silica. Often bleach or hydrogen peroxided is listed. If you want it all some whitening toothpastes are formulated for sensitive teeth and will splashed across the packaging and if you check the label, you should find some combination of the ingredients listed above! Question from Our Member - What is Crown Lengthening And Why Do I Need It? The dental terminology for the procedure is “Clinical Crown Lengthening”. This is a common surgical procedure and is usually performed by a periodontal surgeon who removes gum tissue, bone or both to expose more of a tooth. Clinical Crown lengthening is done when a tooth needs to be repaired with either a filling or a crown and not enough of the tooth sticks out above the gum to support either. This can happen if a tooth breaks off at the gum line or when a crown or filling falls out of a tooth and there is decay underneath. To place a filling or crown they need to expose more of the tooth. This is done by removing some gum tissue or bone. If the tooth needs a crown, the dentist may put on a temporary crown, (this is where the patient may think that the crown was made too short). The temporary crown protects the tooth and makes surgery easier because the periodontist will be able to see how much soft tissue or bone to remove. The area should heal in about three months. After it is healed, your dentist will prepare the tooth again and make the final crown. Originally Posted on our July 2017 Newsletter!